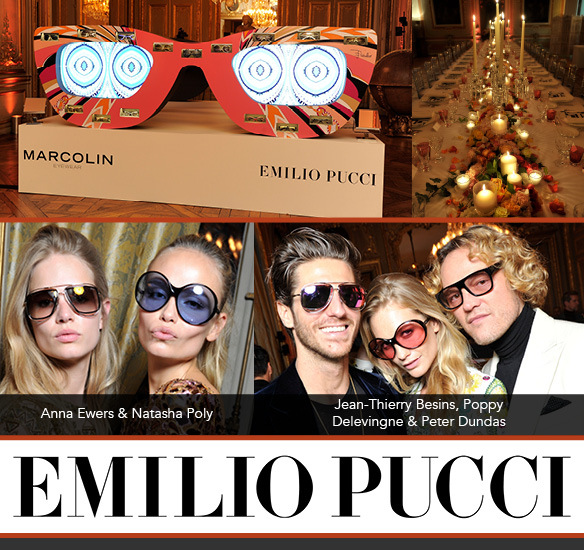 Reveling in the glory of their fabulous new line of specs ‘n’ sunnies, Emilio Pucci hosted a glamorous soiree in Paris with Marcolin Group, their latest partner, to celebrate! Boasting lotsa tasty cocktails, an exclusive seated dinner amid gorgeous flowers and candlelight, and mood-setting tunes, the shindig proved to be the perfect way to kick off the collection. Party-goers—from fashion influencers to models to socialites—seemed to seriously dig the brand’s frames, as many of them flaunted their very own pairs throughout the evening. Take a looksie at the breathtaking event space, and the notable figures sporting glasses and shades below. Now, let’s get to the main attraction: the eyewear, of course! The new frames perfectly interpret the aesthetic philosophy of the Florentine brand—one that’s characterized by tradition, elegance and style, offset by modern touches. A classy reinterpretation of elegance and femininity, the collection showcases on-trend cat-eye, round and square silhouettes, retro-inspired styling and prints, as well as a blend of alluring warm and cool tones. Check out these glasses, especially crafted for the dynamic, style-sure woman, below.